DUNDEE--The Dundee varsity softball team lost to Red Jacket 12-3, Monday, April 8. Megan Sutherland had eight strikeouts on the mound, while Mercedez Roy was 2-for-3 at the plate with a home run. Mackenzie Strait was 2-for-4. The Dundee varsity baseball team topped Marcus Whitman, 6-5, in an away game, Wednesday, April 3. The Scots scored three runs in the fifth, two in the sixth and one in the seventh to take the victory. Dundee's varsity track and field teams competed at Bloomfield, Tuesday, April 2. For the boys, Josh Cramer placed first in the 110 meter hurdles (18.80) and was first in the triple jump (33'2.5"). Preston Cole finished first in the shot put (38'2.75") and third in the discus (112'2"). Matt Wood won the 800 meter run (2:06.88). Leif Hoyt was second in the discus (119'0") and fourth in the shot put (35'2.75"). Austin Brace finished second in the 400 meter dash (57.70) and fourth in the long jump (17'1.5"). Preston Cratsley was second in the long jump (17'11.50") and fifth in the 200 meter dash (25.65). Julian Ortiz took second in the high jump (5'4"). Hunter Crofoot placed second in the shot put (36'5.75"). Nic Laursen was third in the 200 meter dash (24.98), third in the long jump (17'4"), and fifth in the 100 meter dash (12.09). Gabe Kirkendall was third in the 110 meter hurdles (20.76). Tate Hoyt finished third in the shot put (35'9.25"). Steven Webster took fourth in the high jump (5'2") and fifth in the triple jump (29'11.5"). Justin Wood placed fourth in the 400 meter dash (58.28), while Harry Nice was fourth in the discus (106'1"). For the girls, Lily Hall took third in the 100 meter dash (14.06). Hallie Knapp was third in the discus (83'2") and eighth in the shot put (20'10.5"). Ella Pollack took seventh in the shot put (20'11") and ninth in the discus (43'3"). Alaina Cleary finished 10th in the long jump (11'8.75"). Savannah Eaves placed 10th in the shot put (17'10.75"). PENN YAN--The Penn Yan boys varsity lacrosse team defeated Clarence, 12-4, Saturday, April 6. Colton Smith led with four goals and one assist. Conner Fingar scored three times and assisted once. Ayden Mowry posted two goals and one assist. Devon Gerhardt added one goal and three assists. Chase Blumbergs had one goal and an assist, while Clay Kinyoun also scored one goal. In the cage, Jeff Kinyoun had six saves and Griffin Emerson earned one. Penn Yan topped Cazenovia in a home game, Thursday, April 4. The final score was 9-6. Fingar scored four goals, followed by Smith with three. Mowry and Clay Kinyoun both earned one goal and one assist. Gerhardt assisted twice. Goalie Jeff Kinyoun had six saves. The Penn Yan girls varsity lacrosse team beat Aquinas in the team's season-opening game, Saturday, April 6. The final score was 9-8. No additional stats were provided. Penn Yan's varsity tennis team topped Marcus Whitman, 4-1, Wednesday, April 3. Cole Egburtson beat Cameron Clark, 6-4, 7-5. Brian Hollister defeated Chris Bode, 6-2, 7-5. Penn Yan's Lukas Spears lost in singles, 6-0, 6-0. In doubles, Jeremy Fenton and Reid Castner topped Aric Scott and Ricky Dimon, 6-2, 6-2. Spencer Christensen and Connor Hunter won against Lucca Sacheli and Lucian Sacheli, 6-2, 6-3. The Lady Mustangs lost to Mynderse, Wednesday, April 3. The final score was 22-2. Taylor Hight had a triple, while Kiana Larham posted a double. Kayla Andersen had five strikeouts and five walks. Onalia Sheradin struck out four, with one walk. Penn Yan topped Williamson, 9-4, Tuesday, April 2. Andersen posted nine strikeouts and gave up six hits in the win. Larham went four-for-five, with two doubles and a home run. Hight went four-for-four. Sheradin earned a double. The Penn Yan varsity track and field teams competed against Red Creek, Sodus, and Red Jacket, Tuesday, April 2. For the girls, Joddie Decker took first in the 1500 meter run (5:22.54) and first in the 3000 meter run (11:35.44). Jaina Doyle took second in the 3000 meter run (12:56.24) and third in the 1500 meter run (5:51.14). Alexxis Henry tied for second in the high jump (4'6") and was fifth in the 800 meter run (3:01.84). Rachel Wheeler placed second in the 800 meter run (2:57.34). Gracie Murphy was second in the 1500 meter run (5:33.04). Triana Burgos-Farnan placed fifth in the discus (58'10"). For the boys, David Young took second in the 3200 meter run (12:01.24) and fifth in the 1600 meter run (5:30.44). Dominic Lafferty was second in the high jump (5'0") and third in the long jump (17'10"). James Tette finished third in the 3200 meter run (12:09.44). Daniel Jiang was fourth in the 100 meter dash (13.34), fourth in the 200 meter dash (27.14), fourth in the long jump (17'6.5"), and fifth in the triple jump (33'3"). WHITESVILLE--The Bradford/Hammondsport varsity softball game lost to Whitesville in an away game, Thursday, April 4. The final score was 5-3. The combined softball team beat Avoca/Prattsburgh, 9-2, Tuesday, April 2. 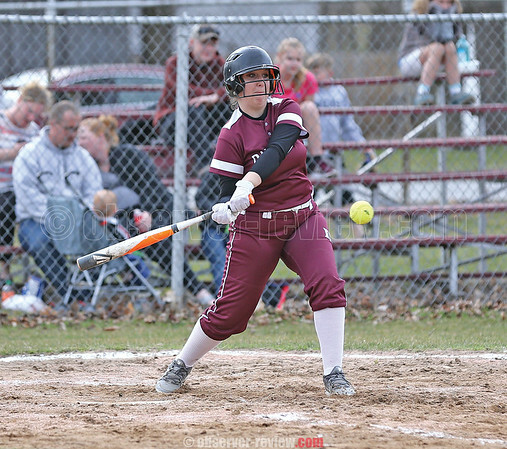 WATKINS GLEN--The Watkins Glen varsity softball team split a pair of games last week, losing one to Dryden, Wednesday, April 3 and winning the other to Whitney Point, Monday, April 1. The Dryden game was lost 18-3 and the Whitney Point game won 16-5. The Watkins Glen varsity lacrosse team defeated Seton Catholic, 8-7, Thursday, April 4. Connor Novinsky posted 14 saves in goal, with Coach Nils Watson adding Novinsky has over a 50 percent save percentage. Watson added, "he has been a great addition to the team this season." Joe Chedzoy and Sam Smith both scored two points for the Senecas. Avery Watson, Ramel Fulcher, Seamus Mooney, and Dawson Wade all earned one point to secure the win. "The team played a better game today," said Watson. "More composed than previous games this season. Passing was better and the defense did a good job of shutting down shooting opportunities." Watkins fell to Elmira Notre Dame, Tuesday, April 2. The final score was 8-7. Chedzoy led with three points. Watson scored two. Mooney and Smith both posted one point. In the goal, Novinsky had 14 saves. The Watkins Glen varsity tennis team blanked Southern Cayuga, 7-0, Tuesday, April 2. Nathaniel Wickham beat Riky Pearson, 6-1, 6-3. Dylan Morse topped John Groth, 6-1, 6-4. Clint Craven won against Sam Perez, 6-2, 6-0. Mathew Sandritter beat Keith Wasleff, 6-0, 6-0. In doubles, Hannah Morse and Jill Cantieni defeated Owen Overhiser and Dan Groth, 5-7, 6-2, 6-3. Alexandria LaMoreaux and Bryson Simmons topped Wisteria Kirk and Kell Grady, 6-0, 6-2. Kathleen Clifford and Enkang Lin defeated Molly Rejman and Mark Saxton 6-1, 6-0. The Watkins Glen girls varsity track and field team beat Campbell Savona, 59-58, Wednesday, April 3. Brianna Hayes finished first in the 400 meter hurdles, first in the long jump (12'2"), and first in the triple jump (25'.5"). Breanna Carl took first in the 1500 meter run and first in the 3000 meter run. Kai Sutterby was first in the 800 meter run and first in the discus (57'). Haley Dean won the 100 and 200 meter sprint. Kaylana Reckczis placed second in the 1500 meter run and second in the 3000 meter run. Madelyn Sutterby took third in the long jump (11'2"). She was also third in the 100 meters. Maya Somerville was third in the triple jump (22'5"). Max Evans placed first in the 800 meter run, first in the high jump, and third in the long jump. Collin Gaylord won first in the discus and second in the shot put. Sam Thorsland was second in the 1600 meter run and second in the 800 meter run. Nick Wilston finished first in the triple jump and second in the long jump. Nate Murphy was second in the 400 meter run. Jordan Avery was second in the high jump. Tim Clifford took second in the triple jump. Cale Sutterby was second in the pole vault. Tyler Hayden took second in the 400 meter hurdles and third in the 1600 meter run. Gabe Planty won the 1600 meter event. ODESSA--The Odessa-Montour varsity track and field team hosted eight schools, Saturday, April 6 for the IAC relay meet. The Odessa boys and girls both finished second. Trumansburg was first overall at the event. Zach Elliott qualified for the state tournament in both the shot put and discus. The boys won the shot put, discus, shuttle hurdle and high jump events. The girls won the shuttle hurdle and pole vault event with Kennedey Heichel clearing 8' and Camille Sgrecci 6'. The combined Seneca Indians varsity baseball team defeated Whitney Point, Monday, April 1. The final score was 7-5. Austin Voorheis was 2-for-2, with one RBI. Sean Kelly was 2-for-4. Johnny Niedermaier was 1-for-3, with two RBIs. Derrick Lewis also earned a hit. Odessa-Montour's varsity softball team beat Groton, 10-0, Monday, April 1. The Indians earned 16 hits. Grace Vondracek was 4-for-4, with two RBIs and a triple. Jolynn Minnier was 3-for-3, with three RBIs, a triple, and a home run. Madisyn Wells was 2-for-3, with one RBI. Dezirae Minnier was 2-for-2. On the pitcher's mound, Vondracek struck out 19. The Indians' boys varsity golf team opened the season with a 271-296 loss to Groton, Thursday, April 4. Tyler Saunders led with a 48. Noah Hollenbeck followed with 52. Eliza Starkweather posted a 62, while Austin Hoyt had a 66. Brett Walters earned a 68. Odessa-Montour's varsity tennis team topped Moravia, 5-2, Tuesday, April 2. Rhys Stermer beat Brady Knutson, 6-3, 6-2. Sara Gardner won by, 6-0, 6-1. Cheianne Webster and Dana Zimmers defeated Alethea Banerjee and Lindsey Jones, 7-5, 3-6, 6-4. Jacy Knapp and Kaylea Simmons won against Isobella Banerjee and Malayna Martin, 6-3, 6-4. Manuela Buffo and Malia Mertens beat Damian Dingman and Madalaina Raymond, 6-0, 6-0. The Indians lost to Waverly, Monday, April 1. The final score was 4-3. Odessa's wins all came from the singles rounds. Dylan Von Neida won against Seth Lloyd. Stermer beat Collin Keefer and Gardner topped Caleb Wilcox.